It doesn't seem like a lot, but I've got something like 25 yards of this stuff, and to do that by hand would be a headache at the very least. 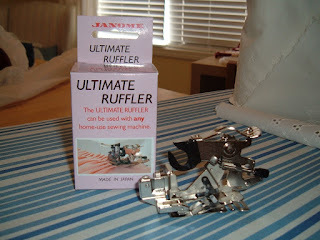 Not to worry, though, because at the last Creativ Festival (I'll need to write an entry about that sometime) I bought myself a ruffler foot! I will admit that this little device had me more than a bit nervous. It's complicated looking and has a lot of screws, gears, thin little guide-flaps, hooks, and springs. 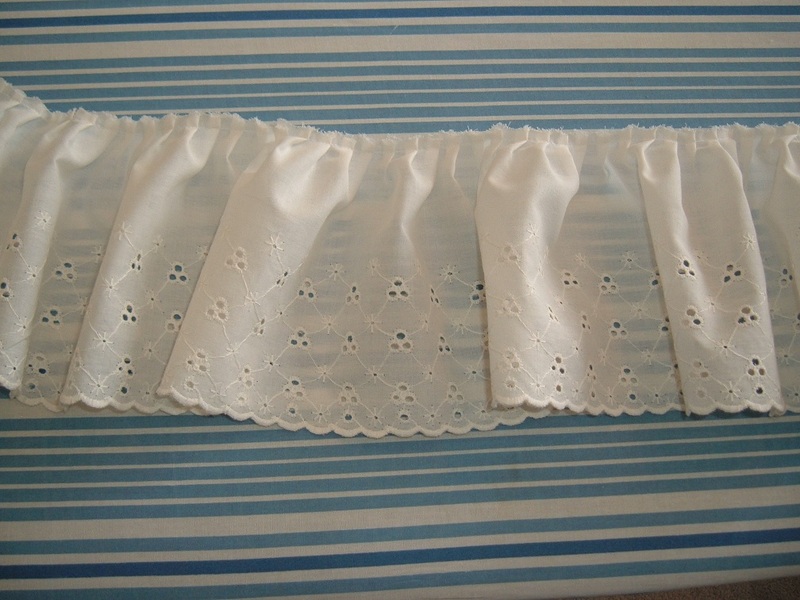 The instructions do give you a reasonable idea of how to attach it to the machine, but they don't really give an idea of the mechanism and how it interacts with the fabric. What's neat about it is that it lets you pick whether it will put a fold every 12 stitches, 6 stitches, or 1 stitch, and how deep that fold is. 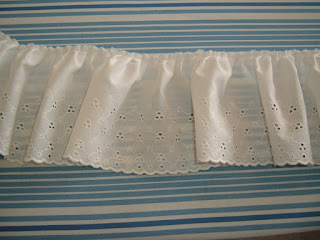 I eventually picked every 6 stitches for the length and 6.5mm for the depth. 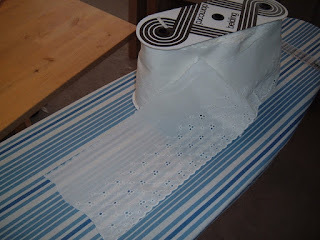 This reduced the length of the fabric by 50% when I measured it out. 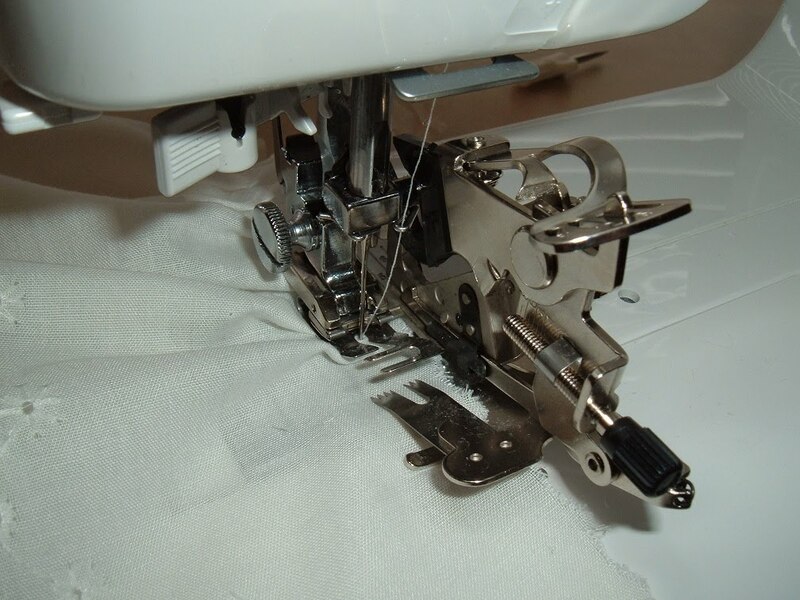 To put the foot on the machine, you raise the needle and the presser foot (and drop the regular presser foot off the machine) and simultaneously feed the giant black hook-thing onto the screw to the right of the needle holder while putting the foot itself onto the foot-holder. 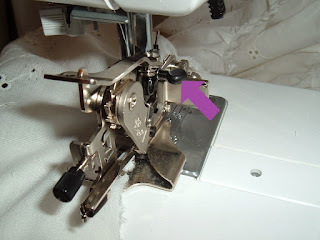 You may have to play around with the positioning of the hole that the needle goes through by two screws at the back of the device - they control forward/backward and right/left. You can see the fabric needs to first feed under a little bar, then under the sharp spiky bit before going under the needle. What the picture doesn't illustrate is the metal underneath the fabric -- there's yet another pinch point right under the needle and the fabric is only free to touch the feed-dogs on the machine after that point. I think I may have forgotten to put the presser foot down when I started to sew the first section as the fabric just didn't move. It's more common than you think -- it looks like it's down even when it's not. Another thing that I learned is how important it is to really tighten the screw that holds the needle in the machine. The device rests on that screw and moves up and down with it (which is how it knows how many stitches have been taken) but unless that screw is tight, it will actually loosen it as it goes. I learned this the hard way when it felt like my machine exploded in front of me. It took me 10 minutes to figure out what was wrong and how to fix it. Thankfully it was as simple as taking the foot off, replacing the needle and its holder, and screwing it very tight -- with a small screwdriver, not my fingers. I usually only finger-tighten, but for this you need tighter than that.